Beth Ellenburg is a professional horse trainer and instructor who brings a unique perspective to the horse world. Gathering together awareness from a variety of equine disciplines, Beth has an enthusiasm for discovering and developing what it takes for both sides of a human/horse partnership to work as a single team and achieve their goals. Beth has ridden and shown horses since she was a small child. From this point on, her life took an equine journey of dressage, eventing, and fox hunting. Beth committed to the world of classical dressage with many renowned trainers, including Kim Walnes, Leslie Olsen, and Kris Erbskorn. She has maintained active memberships with USDF, USEF, and AHA, where she shows as a professional. 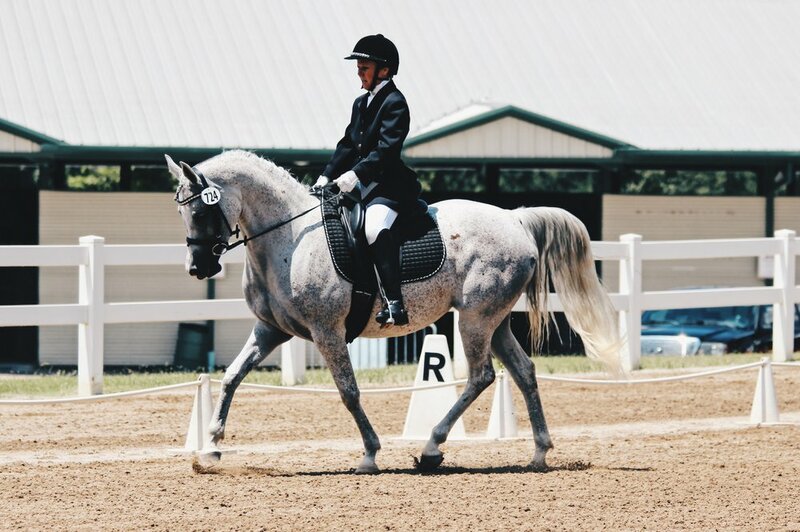 She continues to compete professionally in dressage on her Polish Arabian, BHA Fire Dancer, and has recently started her Fresian/Arabian, Konstantine, in the show ring. She was awarded 4th place for USEF Horse of the Year in 2018, and 6th place USEF Horse of the Year in 2016. Following her passion for horses and psychology, Beth became a certified health coach, a certified equine manager from UGA, and obtained a degree in Human Services and Psychology which allows her to combine her interests in a healthy mind, body, and soul for people while using the horse as a teaching tool. Bonnie received her Bachelor of Science degree in Finance from Kennesaw State University. Bonnie is currently responsible for managing all matters related to boarding, the barn work schedule, horse feeding/dietary supplements, and is also in charge of billing and bookkeeping. Bonnie is the primary contact for potential new boarders and students who would like to tour the barn or receive more information. Bonnie and her daughter have been riding at Greenridge since 2013; they currently own three horses, DeeDee, Gemini, and Tez. Bonnie joined the Greenridge staff in 2015. Teresa has been successful in coaching business’s to develop a plan which will provide them with more profits and lower expenses, all while developing an unstoppable team. She is proficient at speaking engagements, teaching, leading group discussions, mentoring, training, facilitating mastermind groups and more. Her previous experience in the medical field as a registered nurse and paramedic only add to her skills. Teresa's training as a Retreat Coach included a comprehensive learning experience with both distance learning and attending a hands-on training in Colorado. This led to her inspired development of a very special brand of retreat offerings. Teresa has blended her love for horses with her retreat skills to create the Business, Family, and Life Coaching on Horseback programs at Greenridge Equestrian. As a professional woman with a strong background in business, Teresa created her own coaching program using the tools and training she received to offer powerful retreats that inspires her many clients. Sarah teaches all levels of students, from beginners to advanced riders. She has been riding for 18 years and teaching for about 9 years. She grew up in Pony Club and has competed in dressage, 3-day eventing, and competitive trail rides (NATRC). She helps students build up their confidence while having fun in a safe environment. When students are ready, Sarah loves to take them to horse shows and challenge them. Teaching since the age of 19, at 28 years old she has experience teaching students with all different personalities, strengths, and weaknesses. With bachelors degrees in Business Management and Accounting, she knows how to work well with everyone and to stay on track. Sarah has owned two off-the-track Thoroughbreds, one which her best friend now owns, and a Quarter Horse. She plans on getting another horse again in the near future. Sarah joined the instructor team at Greenridge in 2013-2017, and returned at the end of 2018 after traveling around the United States and Europe. She has her own side bookkeeping business and is a co-founder of Horse Shoe Box, a monthly subscription box for horse lovers. Erin has been riding for 13 years and has owned two amazing horses, both of which have taught her a unique approach to teaching with understanding and gentleness. Her riding background is English equitation, dressage, and low level jumping. She is also a firm believer in developing ground work skills as well as riding skills. Erin's goal is to give her students a safe and fun introduction to horses, laying the foundation to become confident and successful equestrians. She teaches them not just how to ride, but how to be around horses with kindness as well as competence and confidence.